The brain is arguably the most important organ in the human body. It controls and coordinates actions and reactions, allows us to think and feel, and enables us to have memories and feelings—all the things that make us human. While the brain only weighs about three pounds, it is a highly complex organ made up of many parts. Years of scientific study have made it possible for scientists to identify the various areas of the brain and determine their specific functions. The following information provides a brief description of some of the major parts of the human brain. The cerebrum is made up of the right and left cerebral hemispheres. The hemispheres are connected at the bottom and have a deep groove running between them. In general, the right cerebral hemisphere controls the left side of the body, and the left cerebral hemisphere controls the right. The right side is involved with creativity and artistic abilities. The left side is important for logic and rational thinking. The cerebral hemispheres are divided into lobes (broad regions of the brain). Each lobe is responsible for a variety of bodily functions. Frontal lobes are involved with personality, speech, and motor development. Temporal lobes are responsible for memory, language and speech function. Parietal lobes are involved with sensation, while the occipital lobes are the primary vision centers. The surface of the cerebrum appears wrinkled and is made up of deep grooves (called sulci) and bumps or folds (called gyri). The outer part of the cerebrum is called gray matter and contains nerve cells. The inner part is called white matter and contains connections of nerves. 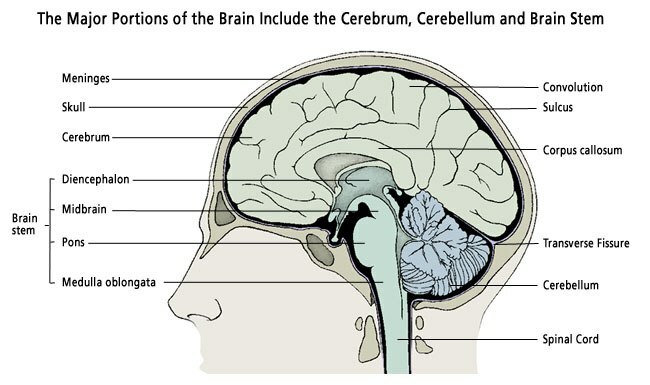 The brainstem is located in front of the cerebellum. Think of the brainstem like a computer hard-drive. It is the body’s main control panel and is responsible for conveying messages between the brain and other parts of the body. The cerebrum, the cerebellum and the spinal cord are all connected to the brainstem. The brainstem has three main parts: the midbrain, the pons and the medulla oblongata. Unlike the cerebrum, the left cerebellum controls the left side of the body, and the right cerebellum controls the right side of the body. The brain is not a solid organ. Instead, there are fluid-filled cavities within the brain called ventricles. The ventricles provide nourishment to the brain. The ventricular system produces and processes cerebrospinal fluid, a clear, watery substance flowing around the brain to cushion and protect it. The brain also contains 12 pairs of cranial nerves. Each is responsible for specific body functions. and look for useful resources on the internet. However, many find this a frustrating experience. To discuss brain disorder symptoms or schedule an appointment with a Princeton Brian & Spine neurosurgeon, call our New Jersey offices at 609.921.9001 or our Pennsylvania office at 215.741.3141. For your convenience, you can also connect with PBS staff online.